Though I often dread the chore of washing dishes, quiet moments at the sink are something I have come to treasure. Back facing the world, centered in my four square feet of space, working with my hands, doing an monotonous task, I have nothing to do but think. Think and wash. Rinse and repeat. It takes me back to a time when tempers flared, expectations were high and unmet. 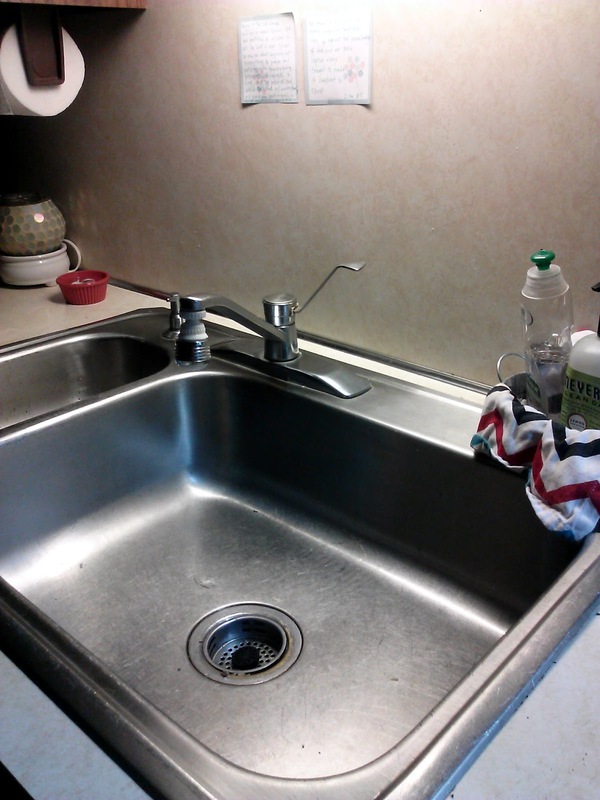 Their fights were in the kitchen and in my child-perception, centered around the sink. By the time the dishes were washed and the kitchen was clean, voices had lowered and peace found its way back in the home. Logically, I know mom and dad weren't really fighting about the dirty dishes, but ironically, arguments did happen in the kitchen, and for some reason I've always associated a clean sink with the return of order, the settling of disputes. Tonight before bed I dragged myself to the kitchen, knowing I would thank myself int he morning for cleaning up tonight. I guess when life is chaotic and out of my control, the dishes are one thing I can dominate. Broken heart? Dry off the cookie sheets. Furious anger? Brillo pad and pot. General sadness? Sweet sweet smell of soap I love (this one is important!). Think and wash. Rinse and repeat. Tomorrow is a fresh start. A new day. My clean sink will greet me with that reminder in the morning. Harsh feelings and a heart ache seemed more manageable once the dishes were dried and put away. The tears cried were wiped up with the dish towel that meticulously cleaned and dried out the sink basin. The verses hanging at eye level reminded me to snuff out the lies and replace them with truth. They implored me to find joy in all circumstances. They reminded me to cling to Jesus. So, yeah, it's weird. One of my best times of praying, thinking, and trusting, are happening while I was the dishes.